The GORILLA MACHINING Precision Glock® slides are the perfect upgrade for your G19 sidearm. Enhance your stock pistol, or add it to an 80% build for increased accuracy and reliability. These slides are manufactured from billet steel to have tighter tolerances than a factory slide, providing increased accuracy and reliability you can count on. Complete slides are ready to function out of the box. Available for G19 Gen 1,2,3 they feature the option of a RMR Cut out. The KONG Slide features an enhanced profile with angled cuts. This custom engineered design provides reduced weight, better balance at the muzzle, and improved grip and friction when in mud, water and other adverse conditions. 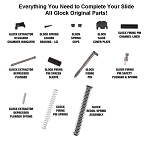 Accepts standard Glock G19 and G17 sights (not included). Hand fitting may be required.